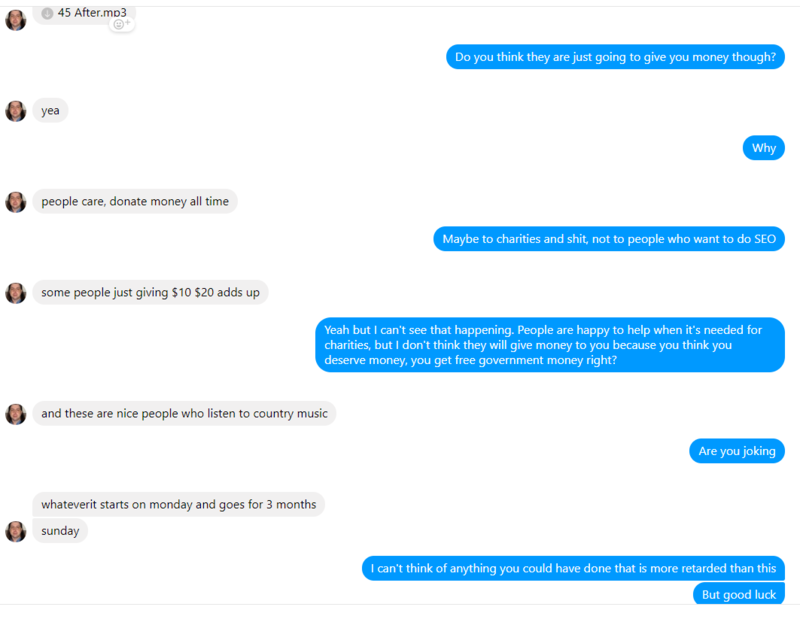 Corey Preiss (Tunescool) is an American marketer who has reached fame but not fortune over the last 5 years, making insulting posts to people who try to help him. Corey Preiss is a special man. One of the true OG's of internet marketing. This is a thread to document his journey and success in life. What do we know about Corey Preiss? 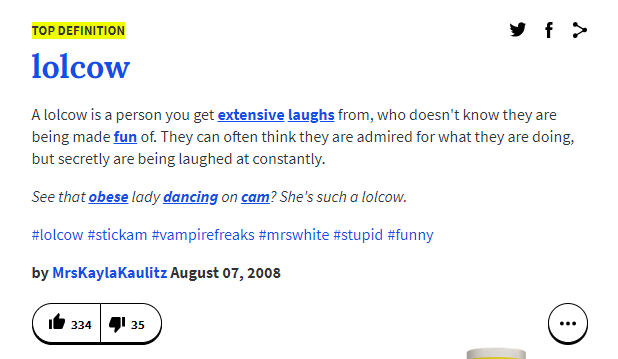 Corey is a 45 year old man from West Allis, Wisconsin. Corey joined the internet forum "Black Hat World" in July 2011, introducing himself as a forum owner of celebrity pictures using the internet handle "Tunescool". Over the next 7 years Corey slowly managed to alienate 100's of members who tried to give him the help and support he desperately needed to support himself. Over the years Corey has set up a number of websites and internet ventures, all of which have been unsuccessful. I believe Corey with a bit of fame has the potential to become as important to the world as Terry A. Davis. It's my aim to document what Corey does over the next few years. In late 2017 Corey came to the conclusion that the best way to make money online is to pretend you can teach people to make money online, so he wrote a book. Helped by Black Hat World members Sherbert Hoover (who formatted the book) and Harry (who designed the cover) the book was created. The book had some unusual features such as double line spacing as well as repeating the content within the book multiple times to increase the length and get accepted into the Amazon Publishing program. 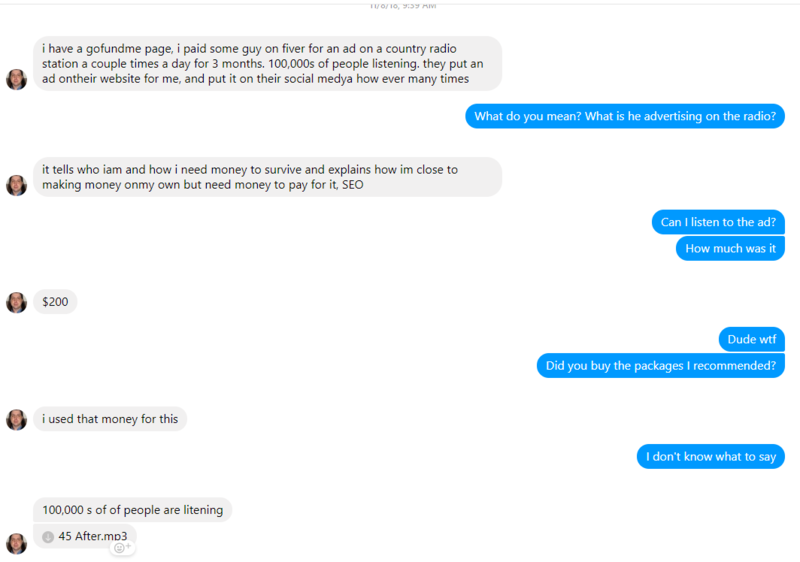 On the 8th of November, with his last $200 Corey purchased some radio adverts from Fiverr.com on a country music radio station with the intention of promoting his latest scheme, a go fund me ebegging page. If you have $10, $20 it will help please. I need money right now, and for my future. I've been on Social Security and haven't worked in over 20 years. I'm unable to work. My body has been in bad shape my whole life, I can't breathe daily. When I did work in my 20's I was ready to go home by 1:00. If I do the slightest thing around the house my back is in serious pain. I'm 45 years old, I hardly eat. I need a car I have to walk everywhere. I'd like to get a better place to live. My parents could die and I'd have no one to help with any money, food, anything. I'm being serious here about everything. I only get $1000 a month from Social Security, pay rent and utilities. My mom controls my check and pays the bills I have no cash to use ever. I depend on her every 4 days for food and whatever else. I don't have a car or can afford food or whatever I may need on a daily basis, soap, razors, etc. I need to pay for car insurance, gas. I need to pay for these things the rest of my life. My mom could die and I'd be stuck here with nothing, she was an alcoholic bartender her whole life and could die any day, she has problems all the time. She's over 60 and I just had an uncle who died at 70 this year from lung and kidney failure who drank everyday. I have 2 pairs of shorts and 2 shirts, sweatpants for when I need to walk to the store in zero degree weather, wind blowing and snowing. I live in a mobile home park that makes I'm serious, noise 24 hours a day and I'm up the whole day I don't sleep. Cars all day that sound like they're from the 80s that are loud, doors slamming, a close train. I need to get out of here and possibly buy a house. I want to better my life and secure my future myself as well. I've been into ranking sites on Google page 1 in the top position for about 6 years. Recently I've learned a lot to get me closer, I have two affiliate sites but can't get there yet. The bottom of page 1 I've gotten but there isn't anything but the first three positions, where a floodgate of money opens with thousands of dollars every month. Those individual pages are on there forever with consistent income. But it looks like I'm going to have to pay an SEO company to get my pages there. They cost $500 a month, but it's an investment. I obviously can't afford it. Thank you to anyone who helps and anyone who does substantially. I grew up in a nice family, had everything I needed, worked as a teenager into my twenties, but I never had anything in my life. Nothing nice. This is my product review site if you need anything, I make a commission. Soundbars, powered speakers, a lot of car stereo stuff, I was a professional car stereo installer for many years. Corey broke the news about this latest scheme through facebook messages. This scheme raised Corey $5.